In trigonometry an angle is usually drawn in what is called the "standard position" as shown on the right. In this position, the vertex (B) of the angle is on the origin, with a fixed side lying at 3 o'clock along the positive x axis. The other side, called the 'terminal side' is the one that can be anywhere and defines the angle. 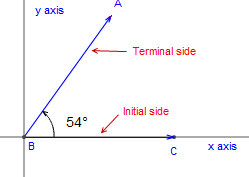 In the figure below, drag point A and see how the position of the terminal side BA defines the angle.